PRESS RELEASE: Mackie today announces two new premium recording interfaces, additions to the popular Onyx family - the Onyx Blackjack and Onyx Blackbird. These powerful new interfaces combine the sonic benefits of Mackie's proven Onyx mic preamps with high-end Cirrus Logic AD/DA converters and workflow-friendly features that are perfect for people starting or expanding upon their studio. "Our new Onyx interfaces offer unmatched recording quality," remarked Mackie product manager, Matt Redmon. "The Onyx preamps alone are far superior to anything in this price range. Combined with the high-end converters and workflow-friendly features and design...the value is undeniable." 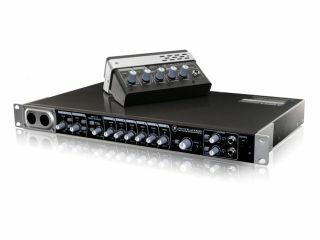 The rackmount Onyx Blackbird delivers studio-grade recording via eight Onyx mic preamps. A 16x16 FireWire interface, Blackbird also features 8x8 ADAT and wordclock I/O, providing ultimate expandability. There are two "Super Channels" on the front panel with dedicated low-cut switches, phantom power and true hardware monitoring options for quick zero-latency tracking. The other channels are equally flexible, utilizing the powerful Blackbird Control DSP Matrix Mixer for quick setup of independent mixes and the ability to route any input to any output. Monitor, main, alt and dual headphone outs with dedicated source selection and level control ensures there are plenty of mix routing options. The Onyx Blackjack and Onyx Blackbird are Mac/PC compatible, work with most major DAWs and include Tracktion 3 Music Production Software. Both interfaces will be available worldwide in August, 2010. The Onyx Blackjack will have a U.S. MSRP of $259.99. The Onyx Blackbird will have a U.S. MSRP of $749.99.